COMPANIES THAT ARE GETTING IT RIGHT 36 D I V E R S I T Y W O M A N S p r i n g 2 0 1 8 d i v e r s i t y w o m a n . c o m Companies That Are Getting It Right Kaiser Permanente Bernard J. Tyson, Kaiser Permanente's first African American chairman and CEO, is fully committed to creating a diverse and inclusive environment at all levels. Kaiser Perman- ente, one of America's leading health-care provid- ers and not-for-profit health plans, is focused on develop- ment, advancement, and leadership opportunities for women and minorities. Women make up nearly 75 percent of the workforce, minorities nearly 65 percent. Nearly half of its executives and more than 35 percent of its board of directors are women. Kaiser Permanente's National Diversity Agenda has helped build a racially diverse workforce in addition to advancing women through development programs and affinity groups. 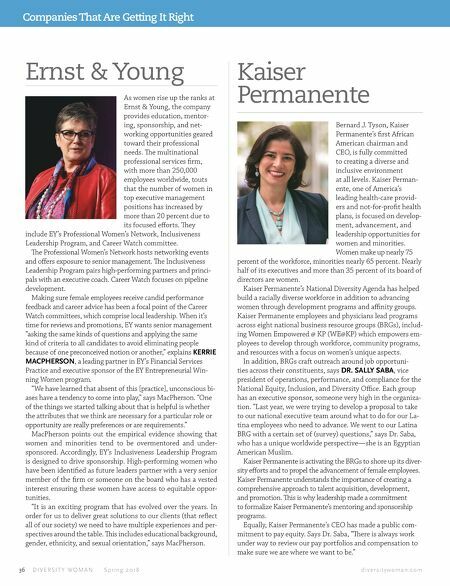 Kaiser Permanente employees and physicians lead programs across eight national business resource groups (BRGs), includ- ing Women Empowered @ KP (WE@KP) which empowers em- ployees to develop through workforce, community programs, and resources with a focus on women's unique aspects. In addition, BRGs craft outreach around job opportuni- ties across their constituents, says DR. SALLY SABA, vice president of operations, performance, and compliance for the National Equity, Inclusion, and Diversity Office. Each group has an executive sponsor, someone very high in the organiza- tion. "Last year, we were trying to develop a proposal to take to our national executive team around what to do for our La- tina employees who need to advance. We went to our Latina BRG with a certain set of (survey) questions," says Dr. Saba, who has a unique worldwide perspective—she is an Egyptian American Muslim. 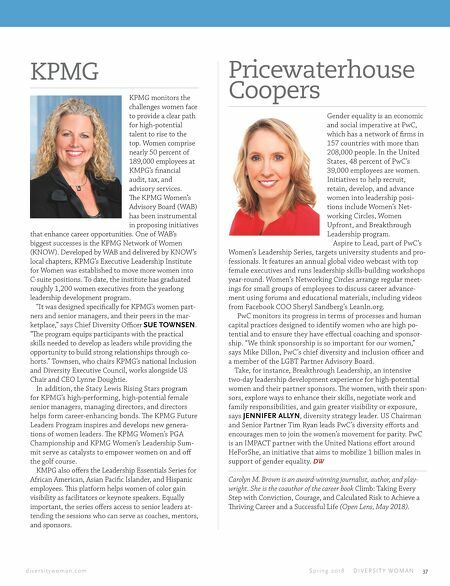 Kaiser Permanente is activating the BRGs to shore up its diver- sity efforts and to propel the advancement of female employees. Kaiser Permanente understands the importance of creating a comprehensive approach to talent acquisition, development, and promotion. is is why leadership made a commitment to formalize Kaiser Permanente's mentoring and sponsorship programs. Equally, Kaiser Permanente's CEO has made a public com- mitment to pay equity. Says Dr. Saba, "ere is always work under way to review our pay portfolios and compensation to make sure we are where we want to be." Ernst & Young As women rise up the ranks at Ernst & Young, the company provides education, mentor- ing, sponsorship, and net- working opportunities geared toward their professional needs. e multinational professional services firm, with more than 250,000 employees worldwide, touts that the number of women in top executive management positions has increased by more than 20 percent due to its focused efforts. ey include EY's Professional Women's Network, Inclusiveness Leadership Program, and Career Watch committee. e Professional Women's Network hosts networking events and offers exposure to senior management. e Inclusiveness Leadership Program pairs high-performing partners and princi- pals with an executive coach. Career Watch focuses on pipeline development. Making sure female employees receive candid performance feedback and career advice has been a focal point of the Career Watch committees, which comprise local leadership. When it's time for reviews and promotions, EY wants senior management "asking the same kinds of questions and applying the same kind of criteria to all candidates to avoid eliminating people because of one preconceived notion or another," explains KERRIE MACPHERSON, a leading partner in EY's Financial Services Practice and executive sponsor of the EY Entrepreneurial Win- ning Women program. "We have learned that absent of this [practice], unconscious bi- ases have a tendency to come into play," says MacPherson. "One of the things we started talking about that is helpful is whether the attributes that we think are necessary for a particular role or opportunity are really preferences or are requirements." MacPherson points out the empirical evidence showing that women and minorities tend to be overmentored and under- sponsored. Accordingly, EY's Inclusiveness Leadership Program is designed to drive sponsorship. High-performing women who have been identified as future leaders partner with a very senior member of the firm or someone on the board who has a vested interest ensuring these women have access to equitable oppor- tunities. "It is an exciting program that has evolved over the years. In order for us to deliver great solutions to our clients (that reflect all of our society) we need to have multiple experiences and per- spectives around the table. is includes educational background, gender, ethnicity, and sexual orientation," says MacPherson.